St. James of the Marches was a Franciscan priest in the 15th century. He was born into a poor family near Ancona, Italy in 1391 and was educated by his uncle, who was a priest. He continued his education, eventually acheiving the degree of Doctor in Civil Law from the University of Perugia. He worked for awhile as a tutor in a noble family, but on July 26, 1416, he was received into the order of Friars Minor in the chapel of the Portiuncula, Assisi. After completing his novitiate, he studied theology under St. Bernardine of Siena. On June 13, 1420, h was ordained a priest, and soon began to preach in Tuscany, in the Marches, and in Umbria. For half a century, he continued as a missionary and preacher. St James of the Marches preached penance, combated heretics, and was on legations in Germany, Austria, Sweden, Denmark, Bohemia, Poland, Hungary, and Bosnia. He was also appointed inquisitor against the Fratelli, a heretic sect that dissented from the Franciscans on the vow of poverty, among other things. He was offered the See of Milan in 1460, but he refused it. Then, on Easter Monday, 1462, St. James, while preaching at Brescia, repeated the ideas of some theologians that the Precious Blood shed during the Passion was not united with the Divinity of Christ during the three days of His burial. He was accused of heresy for saying that, but no discussion or resolution was ever granted to his case, and the matter was ignored or forgotten. 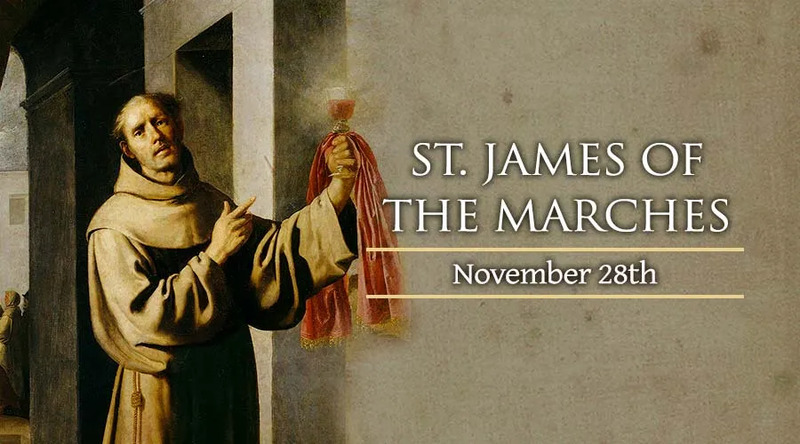 James spent the last three years of his life at Naples, and was buried there in the Franciscan church of St. Maria la Nuova, where his body can be seen today. He was beatified by Urban VIII in 1624 and was canonized by Benedict XIII in 1726. Naples venerates him as one of its patron saints.